I'm back home after a very fun get~away to the Jacksonville, FL area, and nearby Camp Blanding, a Florida National Guard and Army Reserve facility. What was I doing at an army camp you ask? Well....I joined a 180 quilters for a quilting retreat! Isn't this an awesome sight? This is actually only half of the room! This room was just full of whirring sewing machines, laughter and chatter, and boundless creativity. It was very energizing! Projects of all shapes and sizes, and every kind of fabric you could think of were in this room. It was so fun to wander from table to table to see what everyone was working on! The Camp Blanding retreat is hosted twice a year by my pal, Gloria Parsons (Olde Green Cupboard Designs). She invited Lynne Hagmeier (Kansas Trouble Quilters) and me to teach classes and give trunk shows for the folks at the retreat. What fun! And Sandra's quilt. 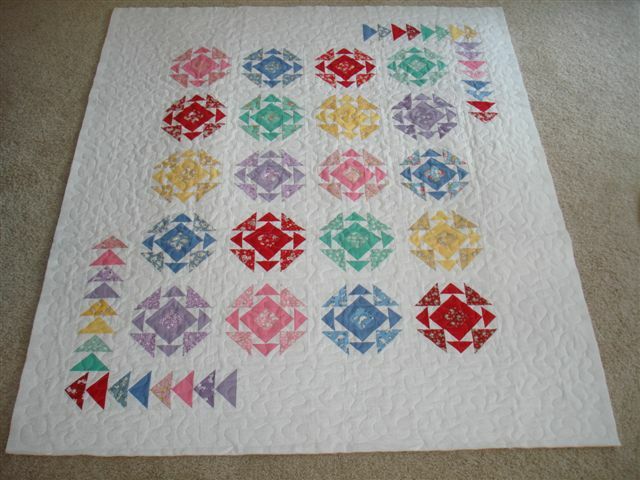 I just love seeing the same quilt in different colorways, don't you? Also in attendance at Camp Blanding were my pals from Red Crinoline Quilts, Paula Barnes and Mary Ellen Robison. I have some news to share about a few of their upcoming projects in my next post, so stay tuned! Thanks for taking the time to stop in today! The weeks have flown by and here we are, on our fourth block already. We're also more than half way into January. It seems like Thanksgiving was just a few days ago. Hope you've been able to take some time for yourselves to sew. Let's get started on our last block. This is a Courthouse Steps block which uses up lots of little scraps. My block has been paper pieced which gives us really tiny little strips. Gosh, I love the narrow strips and the variety of fabrics make it sparkle and shine. 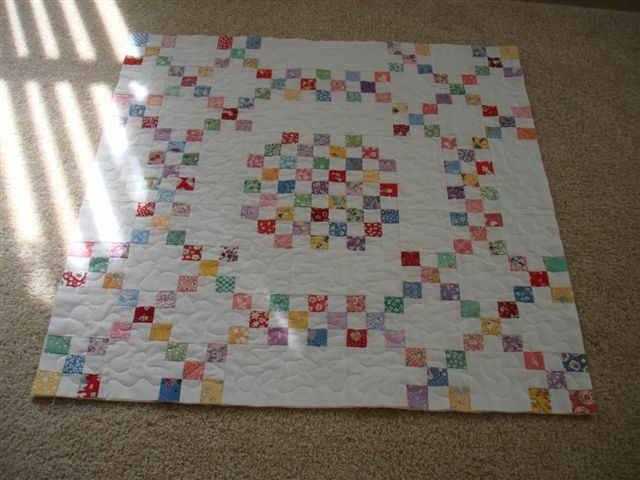 Paper piecing blocks like this use up a whole lot of scraps. Even a teeny tiny or long narrow piece can be useful here. I especially like to use fabrics I don't really care for anymore. Often the color is really good, but I don't care for the print. Even those UGG fabrics can do well. For our sew-along, I will assume you have knowledge of paper piecing as this isn't the proper forum to teach it. If you don't know how, or don't care for paper piecing, no worries!! Scroll down to find a Log Cabin substitute block you can make. The pieces won't be as tiny....I promise. Better yet...use an ophaned Log Cabin!! Click here to download the Courthouse Steps paper piecing template. Make (1) Courthouse Steps block that should measure 4 1/2" unfinished. If you like paper piecing tiny little strips like this, as I do, you'll be happy to know I've been working on several new designs that feature these tiny wonders. Stay tuned to my blog for announcements later this year!! *Cut the center red square 1 1/2"
*For the blue strips, cut (1) 1" x 2" and (1) 1" x 2 1/2"
*For the brown strips, cut (1) 1" x 3" and (1) 1" x 3 1/2"
*For the black strips, cut (1) 1" x 4" and (1) 1" x 4 1/2"
*For the light with black motif, cut (1) 1" x 1 1/2" and (1) 1" x 2"
*For the light circle motif, cut (1) 1" x 2 1/2" and (1) 1" x 3"
*For the light with red outline flowers, cut (1) 1" x 3 1/2" and (1) 1" x 4"
I recently put the final touches on two new fabric lines. Inspired from my collection of antique quilts, Prairie Wovens & Dobbys is a wonderful collection of woven homespun fabrics. I see a whole lot of dobby type wovens in my antiques and love them, so I made a point to include some of those as well! Both the wovens and dobbys add a lovely texture and a whole lot of interest within the quilt. Of course, the wovens look great in quilts all by themselves, but it's when they're paired with cotton prints that I really get jazzed!! Pin Money is the name I chose for the cotton prints. (You'll read more about how I chose the name in a future post.) Pin Money features a variety of prints in eight colors. These are my "wheelhouse" colors, and I live with these colors, quilt and design with these colors, decorate my home with them, and they lived on the prairie, and live in my heart. They are shades of reds (oh, what a surprise, Pam! ), blues, greens, blacks, browns, golds, dusty pinks and purples. You'll see these same eight shades in Prairie Wovens & Dobby's, too! The light print isn't as light as it appears in the photo. The flash lightened it quite a bit! There are five shirting style prints in Pin Money and this is just one of them. I love the black tossed wheat print and think it will make for great border, and how about using the gold homespun and wheat print together in a block? Oh....I'm itchin' to get stitchin' already!! That little pinwheel print is so darn cute! L O V E it paired with the brown/red/black woven! YUM! The light woven is actually one of the dobbys. For those of you not sure what I mean by dobby....they are basically woven textiles that have raised threads that bring a "dimensional" texture to the fabric. Notice the raised beige threads? And...the four longer brown threads that look like stitches on top of the background? Those elements make this woven a dobby. They add so much to a quilt, and I'm anxious to pair the prints and plaids together, just as our quilting ancestors did more than a hundred years ago! I sure hope you liked this little preview of a few of my newest fabrics. I'll post a few more photos for you soon. I'm not sure when Prairie Wovens and Pin Money will be in your local quilt shop, but rest assured that when I do know, I'll pass the news along to you!! I'm headed out of town to Jacksonville, Florida, to join Lynne Hagmeier (Kansas Troubles) and Gloria Parsons (Olde Green Cupboard) at Gloria's Camp Blanding retreat. I can hardly wait! Winter finally arrived here in the Chicago area, and I'll get a reprieve from the bitter cold. Plus...how can you go wrong spending time with fellow quilters (about 200 of them!) I know it will be a blast!! I'll try to post while I'm there. Enjoy the spectacular show of the Fall Colors of the New England coast line from the ship as we travel to six ports of call. There will be several projects to keep you sewing while we're at sea, then enjoy the sights of Halifax, Saint John, Bar Harbor, Boston, Newport, and New York City!! We'd sure love to have you join us (so much fun sewing and traveling with friends!). Click here to read all about the cruise. Time is running out....so please call today!! Did you all have success with your on-point Four Patches!! Hope so! This week, we're making use of some orphan Half Square Triangles. You'll be finished with this block in no time! You'll need (16) assorted HST that measure 1 1/2" unfinished. You can certainly take larger orphan HST and trim them down as well. If you need to make a few, follow the cutting instructions below. *Cut (16) 1 7/8" light and medium/dark squares. Choosing a wide variety of fabric prints and colors will give this block extra sparkle. Arrange the HST as shown, then sew together into rows. I pressed rows in alternate directions for opposing seams, or you can press them open. Sew rows together for a block that should finish to 4 1/2". Introducing Star Strings in Primitive Quilts Magazine! 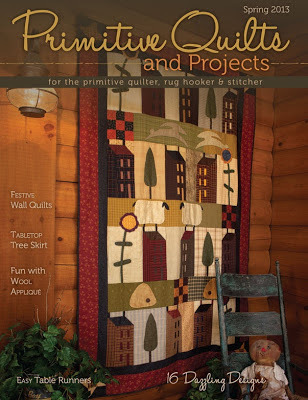 The new issue of Primitive Quilts magazine is ready and I'm so jazzed to have a quilt in the Spring 2013 issue!! As you can see, there are "strings" in the center of each star. This is a stash buster, and easy breezy with a paper piecing template. Pick up a copy of the Spring issue of Primitive Quilts magazine at your local quilt shop. They will begin arriving there next week. Each issue is always loaded with wonderful folk art & primitive quilts. Hope you like Star Strings! Pick up the magazine and make one for yourself!! Sew~Along Block Technique Wins Approval!! I can't tell you how happy your comments have made me!! Several of you have seen and used the technique I showed in Part Two of the sew~along, but most have not, and were intrigued to try it, if not anxious to do so. To be clear, this is not a technique I invented, but have used for several years. I'm a teacher at heart and nothing makes me more jazzed than to share a good hint with other quilters! My thanks for taking the time to comment and let me know your thoughts.....and so....that brings me to announce a winner. ....WOW! What a way to do that block! I'm sure going to give it a try. Thanks for sharing. 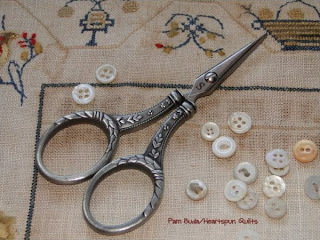 Mary won a pair of heirloom scissors pictured above!! Last week, I received an email from Patty E. who lives in Oregon. She sent me photos of several of the quilts she made from the Prairie Women's Sewing Circle club. Patty has made ALL of the quilts thus far! Amazing!! Patty was a little shy in sharing her photos because she used 1930's reproductions instead of the Civil War repro fabrics I used. I encouraged her to show them because that's simply what Patty likes, and I knew we'd love to see what she'd done. I think they're lovely...and I'm pretty sure you will think so, too! 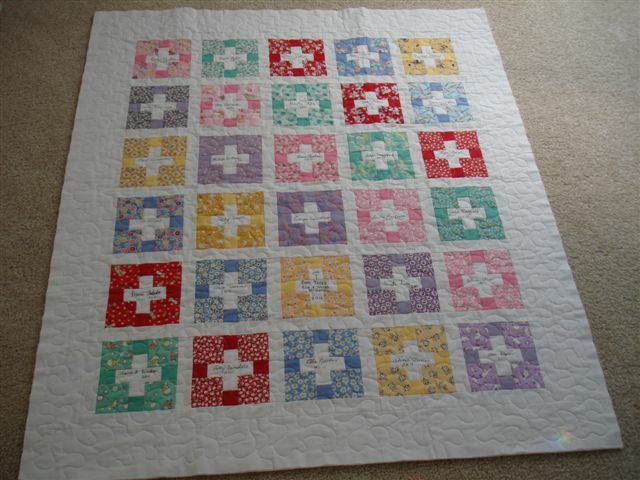 Check out my version of the same quilts on the PWSC club covers on my sidebar. Really fun to see how different and beautiful they are!! Patty took the Yo-yo's that belong in the center of the Journey One Bonus project and framed them. Very striking in their simplicity! Patty's version of my signature quilt, Remember Me, featured on the front cover of Journey Two. Patty's version of Olde Settler's Way, also from Journey Two. Patty's rendition of Journey Two's quilt Next Door Neighbor. Last but not least is the Prairie Huswyfe, also from Journey Two. Patty....thanks so much for sharing your lovely quilts with all of us!! One last thing I thought I'd share with you is a new product you just may need to know about. My friend, Ronda, gave this to me...thanks Miss Ronda! It's specially formulated for delicately cleaning vintage textiles such as quilts, linens, fabric and lace. Look for it at your local quilt shop. We meet again!! Hope I didn't loose anyone with the small Flying Geese and I sure hope you enjoyed making the block. Did you have orphan units lying around to use? I hope so. They needed a home. We are starting with Quarter Square Triangles. Yup...not a typo! If you have orphan Quarter Square Triangle units, great! They need to be 2 1/2 inches unfinished. If not, follow the cutting instructions below to make your QST's. *From assorted prints, cut (8) light and (8) medium/dark squares 3 1/4". Use your favorite method to sew (4) assorted QST's that would now measure 2 1/2" unfinished. You will definitely have leftover units, or more orphans, for another project! We're gonna take those QST's and turn them into on-point Four Patches. This is so fun!! *Cut (4) 1 1/2" matching squares from (4) assorted medium/dark prints. Draw a diagonal line on the wrong side of all of the squares. Position a square in opposite corners of the Quarter Square Triangle unit. Sew on the drawn line; press and trim. Repeat with the remaining corners. See the Four Patch emerging? And...there it is!! I love this technique. 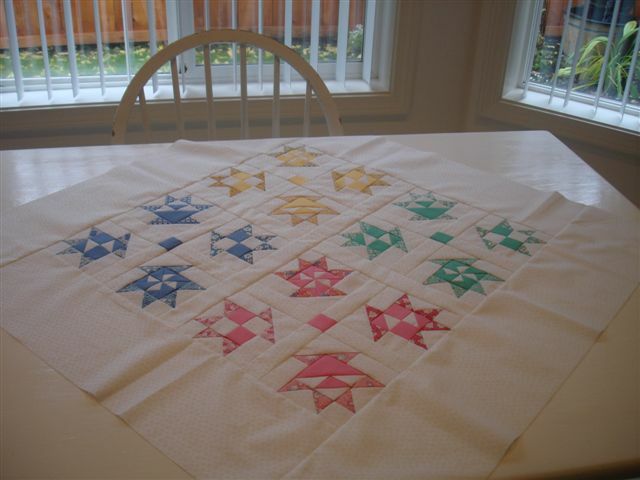 It's not always easy to sew triangles to the sides of a plain square or pieced block. It seems like something always goes awry on at least one corner. With this technique, connector corners solve that issue, you're never sewing with any bias edges exposed, and you can make a very tiny Four Patch, but never sew with any tiny pieces!! Love, love, love it!! Repeat the process with the remaining (3) QST's. All should measure to 2 1/2" unfinished. Arrange the units for the block as shown, paying specific attention to the position of the Four Patches. The lights alternate direction. Sew the units into rows, then sew rows together. Press seams open in each step. Your block should measure 4 1/2" unfinished. I'd love to hear your comments on what you think about this technique. Have you ever done it before? Do you like it? I'll randomly draw a winner and give a special little give away if you leave me a comment. Winner announced on Monday. New from the Heartspun Quilts studio is my Blooming Hexagon Pincushion!! 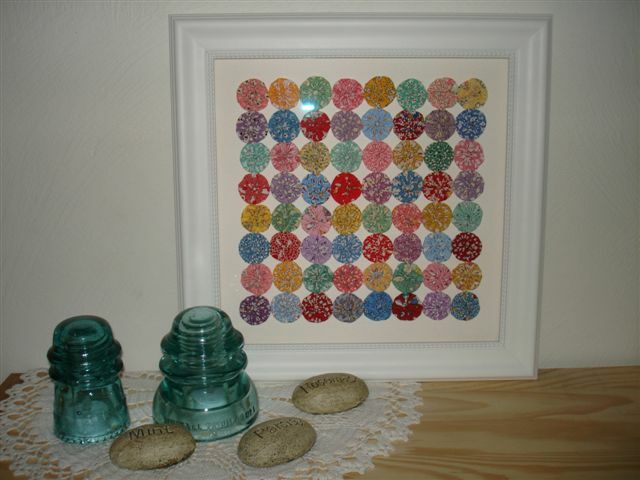 This charming pincushion pattern & kit features instructions on how to sew hexagons, and includes full color instructions on how to make the pincushion. It also includes the paper pieces for the hexie bloom and the vintage zinc jar lid!! I have a limited number of pattern/kits available right now. If they're sold out, don't worry, I'll have them back in stock from time to time, so check my website. I want to thank all of you who gave me the needed advice to get Blogger to upload my photo and get me back in business. I sincerely appreciate you making time and effort in your busy day!! A Bit Frustrated to Say The Least!!! For some of us writing blogs, this week has been extremely frustrating because Blogger won't allow us to upload any photos!! I've been trying for days to no avail. I'm looking into the problem, but for now am unable to create the posts I want to. If anyone has information on this, please share with me. Don't worry about Friday's Sew~Along post....I created it in advance, so all should be well with that. In the meantime...don't give up on me. I'm working on this!! Happy New Year and welcome to Part One of my Orphans & Scraps Sew~Along!! I'm so happy that you've joined me. *Cut (8) 1 1/2" x 2 1/2" assorted light print rectangles. *Cut (16) 1 1/2" squares (in matching pairs or not!) of assorted medium or dark prints. measure 1 1/2" x 2 1/2" unfinished. Arrange the Flying Geese units as shown. 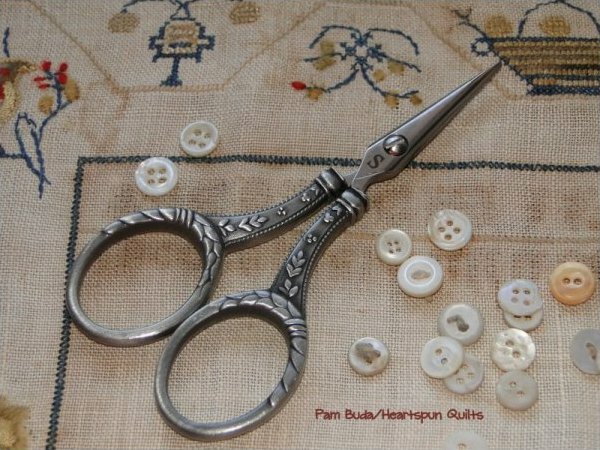 Sew them into pairs; press seams open. Pairs should measure 2 1/2" square. Sew the pairs together into rows, then sew rows together; press seams open. Your block should measure 4 1/2" unfinished. That was fun, and we're done for now! Part Two coming up next Friday! P.S. 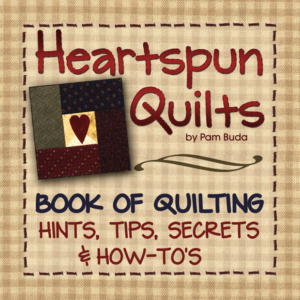 There's a lot of great information about starching your fabrics, making Half & Quarter Square Triangles larger and trimming them to perfection, making perfect Flying Geese, perfecting your 1/4 inch seams, pressing, and a whole lot more in my Heartspun Quilts Hints Book!! Click here to read more about it. I am touched beyond words by all the lovely comments I received. You made me smile and laugh, touched my heart and soul, and I appreciate each and every word you shared! Thank you all for taking the time to tell us about what you're hoping for in 2013. 1. What wonderful goals-kindness and graciousness seems to be slowly fading-how wonderful it would be if each and every one of us adopted those goals. What is my goal? My terrific hubby and I have been the care givers for the last 8 years for a really good friend who is a two time cancer survivor. It is looking like he will not make 9 years and my goal is to lose the 15# put on through those stressful times and to get back to an exercise program. Wishing you and your hubby a wonderful 2013! Congratulations, Sheila S! Please send me an email with your address so I can get your scissors to you. As I read thru the comments, it became very clear that we all have so much in common. We want to excercise more, loose weight, become more organized, finish more UFO's, keep in touch with people we love, and take more time for ourselves to enjoy our lives. We certainly want to continue making more quilts, and use up scraps...and enjoy the process as we piece. Yes...we are certainly not alone in sharing those goals! Several of you shared personal challenges, and to Catherine Z....you and your hubby will be in my thoughts as you take this journey together. And, Mardi....as your grandson returns to his new Sandy Hook Elementary School today, I will be joined by our entire nation as we send love and healing wishes to all affected by this tragedy, especially the little ones. Remember, too, that our fellow Americans on the east coast still need help recovering from Hurricane Sandy, too!